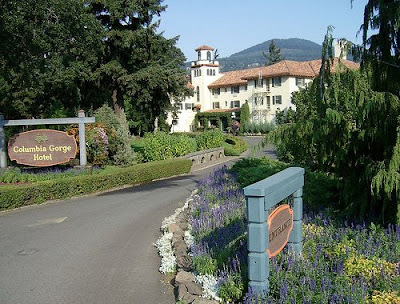 The historic Columbia Gorge Hotel is located about an hour from Portland in Hood River, just off the Columbia River Highway / Scenic Byway / Interstate 84. One of the west's most historic hotels, the Columbia Gorge Hotel was built about 1915 and restored to historic splendor around 1960 after a stint as a retirement home. The hotel is perched atop the cliffs overlooking the Gorge with a 200 foot waterfall just below. The landscaping here is spectacular making it a favorite place for elegant weddings. Notables who have stayed here include Presidents Roosevelt (FDR) Grover Cleveland.